PHOENIX – Every week over the next few months, Swimming World Magazine will feature a camp specializing in teaching swimmers how to improve their technique, swim faster and have fun with some of the biggest names in swimming. Motivation is the part of every package! Programs may include day and overnight camps as well as distance and stroke specialization. 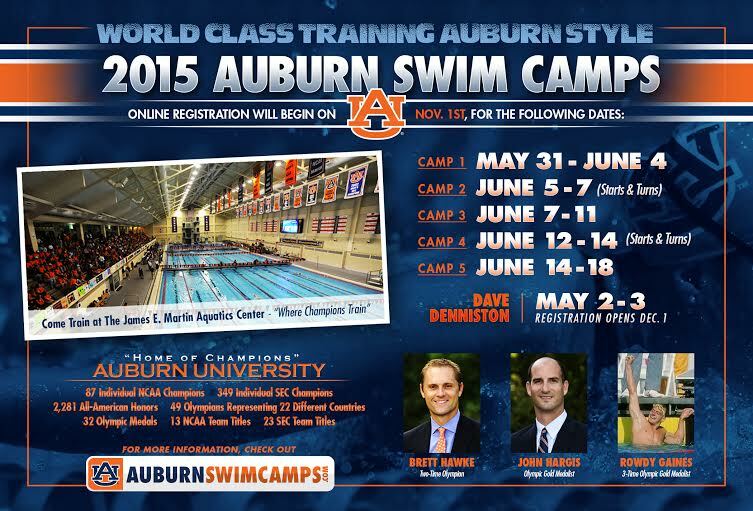 This week we feature the Auburn Swim Camp in Auburn, Alabama. Head Coach Brett Hawke and his Auburn coaching staff will combine the best of the Auburn camp tradition with a choice of either a 2, 3, 4, and 5 day camp. (You can sign up for more than one camp!) Each camp features technique instruction that provides swimmers with lifelong tools for success. Bret Hawke is the Head Coach of Auburn University Swimming and Diving and a two-time Olympian. Hawke was the Bahamas national team coach for the 2012 London Olympic Games and coach of former Auburn swimmer and 2008 Beijing Olympic Gold-Medalist, Cesar Cielo. He was the 2009 World Championships Asst. Coach and 2008 Olympic Coach for Brazil. Hawke was named the 2009 SEC and NCAA Co-Head Coach of the Year, and 2012 SEC Men’s Coach of the Year. Coach Hawke, will be joined by a staff of highly qualified, accomplished, and enthusiastic coaches, counselors and collegiate swimmers to present the 2015 Auburn Swim Camps. Auburn men and women have won a combined 13 NCAA Championship titles and a combined 23 SEC Championships! Spend a week at Auburn “Where Champions Train” and learn how to be the best that you can be at the 2015 Auburn Swim Camps. Enrollment is limited and sessions do sell out, so don’t delay. Register TODAY!